Something Lurking in The Shallows? Because of the internet, humans are reading more than ever. The problem in this, according to Nicholas Carr’s The Shallows: What the Internet is Doing to Our Brains, is that our reading has become shallower. His argument is not that the internet is full of intellectually trivial content but that the medium itself encourages shallow reading and impedes our ability to do the deep, contemplative reading associated with books. 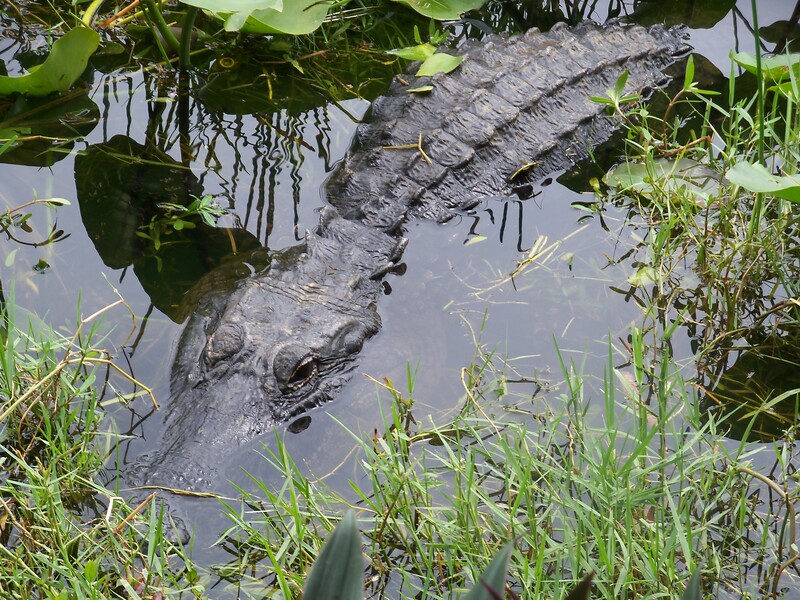 An alligator in the Everglades, which very poorly represents the ultimate danger that Carr sees lurking in the shallow reading encouraged by the internet (“As we come to rely on computers to mediate our understanding of the world, it is our own intelligence that flattens into artificial intelligence” (224)). The internet is all about linking things together, but hypertext forces readers to make decisions about clicking, sometimes imperceptible, that use up precious cognitive resources. With its pop-ups, email alerts, and flashy multimedia content, the internet is perfectly designed for interruption and distraction, also taxing our working memory. There’s only so much that our working memory can handle at once, so when the nature of the internet forces us to use more of it just to read what’s in front of us, it hampers our ability to simultaneously comprehend, retain, and reflect on the meaning. In contrast, because the medium of the book does not engage all of our working memory, it encourages us to comprehend, retain, and reflect. As Carr explains, “It is the very fact that book reading ‘understimulates the senses’ that makes the activity so intellectually rewarding” (Carr 123). We can debate the text. We can call to mind things we already know and make connections to the new information. We can develop novel ideas and solutions. Of course, Carr points out, “It’s possible to think deeply while surfing the Net, just as it’s possible to think shallowly while reading a book, but that’s not the type of thinking the technology encourages and rewards” (116). And the biggest problem to Carr is that the internet’s influence on our brains is not confined to the time we spend on it. Because our brains remain “plastic” (malleable) throughout our lives, the more time we spend on the internet, the more our brains mold to do the kind of thinking that the internet rewards. Even when we step away to try to read a book, our brains continue to think like we’re on the internet. Carr asserts that our brains respond so intensely to the internet because distractedness comes naturally for us, whereas the practice of deep reading is unnatural and takes significant time and effort to learn how to do it. If this is the case, why should we mourn the loss of deep reading or even the death of the book? For Carr, the answer is that every idea, invention, work of art, and scientific breakthrough that can be traced back to the Enlightenment is a product of the literary mind. If the internet causes us to abandon the book and deep reading, we also abandon the value that we place on intellectualism and our very ability to do intellectual work. So are we really headed for an internet-induced “Dark Age”? I think this is where the flaws in Carr’s thinking are most apparent. Where is the evidence that the pace of intellectual achievement, technological innovation, creative endeavor, and scientific discovery is slowing? Perhaps it is just too soon to reap the rotten fruits of our internet brains, but I would expect to see some early indications, and Carr does not provide anything to merit his utter pessimism. What is even more distressing to me about Carr’s argument is that by upholding the literary mind as inherently valuable, he reinforces notions of the superiority of Western knowledge systems. Even if it was unintended, his fetishization of the book gives the impression that non-literate societies did not and do not accomplish as much or contribute to humanity as much as literate ones. Moreover, if we value the products of the literary mind, it is not because their value is intrinsic but because post-Enlightenment Western culture teaches us (“us” being everyone who is linked through globalization) to value them. Because Carr does not examine why he thinks the achievements made possible by deep reading are so important, instead taking this as a given fact, it limits his ability to say that the destruction of the literary mind is a bad thing. And isn’t it possible that its destruction might not be so bad? Yes, we can credit the literary mind for the smallpox vaccine, the theory of relativity, and (as Carr mentions) War and Peace, but we can also credit it for scientific racism, eugenics, and The Birth of a Nation. You could just blame the latter group of “achievements” on human nature, claiming that some people have always done bad things and that some people will always do bad things, regardless of their intellectual tools. That doesn’t tell the whole story, though. For most of its history, the literary mind was only attainable by members of privileged social categories, and it is still only attainable by those with time, capital, and social approval. Concentrating the resources for consuming and producing information amplifies the power of the privileged to dictate the terms and definition of “progress.” Could breaking the monopoly over information enable us to move closer to equality and universal respect for human rights? Is it possible that empowering a larger number of “shallow” minds could be an improvement over elevating a few “deep” ones? I don’t expect The Shallows to have a definite answer to these questions, but I do think Carr should have explored the implications of privilege in the practice of deep reading. To be clear, I am not so naive to think that the internet is a perfect equalizer (it often reproduces society’s inequalities and inequities), but it does enable people to be connected and informed with less time and capital than is demanded by the cultivation of the literary mind. Carr admits that “only a curmudgeon would refuse to see the riches” of the internet, but he never elaborates on what those riches are (10). This gives a skewed picture of what we have to gain and lose by using the internet. For all of my criticism, I do think that Carr has some valid points. His evidence that the internet hinders our ability to understand and remember what we read is convincing, and he provides a solid argument that the internet’s effects on our brains persist when we’re away from the screen. Anecdotally, The Shallows seems to explain why I find concentrating on a book so much more challenging than ever before and why mindlessly scrolling through listicles feels so intoxicating. Looking at this book from the perspective of digital humanities, I think there is a practical lesson in it. When planning and executing digital humanities projects, we need to resist the impulse that the internet makes everything better. We should carefully consider: is this something that will actually promote comprehension, retention, and reflection, or is this just a cool idea that will mostly encourage distraction and superficial understanding? We are, of course, limited by the confines of the medium, and this is why Carr takes such a fatalistic stance. But I’m a little more hopeful. Although I don’t have all of the answers yet, I’m starting to understand, more and more, that the purpose of digital humanities should not be to mold the humanities to the digital world but to humanize the digital.